Open RoadHis most memorable role yet. In addition to being dark, ugly and in your face, “Nightcrawler” is a hilariously scathing examination of journalistic integrity. 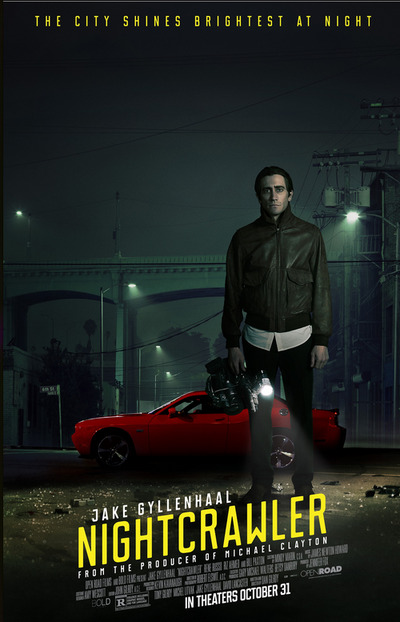 Bolstered by a career-best performance by Jake Gyllenhaal, “Nightcrawler” functions as both a send-up of the “if it bleeds it leads” mentality as well as a fascinating character study of a complete sociopath. We meet Lou Bloom (Gyllenhaal) as he breaks, enters, and steals as his only means of making a buck. One night after witnessing a traffic accident, Bloom notices video producers shooting the grisly scene and almost immediately decides to get himself a camera and a police scanner and become a freelance video producer. It’s not long before he crosses the line and starts setting up crimes just so he can get some quality coverage. Gyllenhaal shed 30 pounds for the role, and his usually charming smile comes off a bit more sinister when it’s plastered on the face of Lou Bloom, the film’s deranged lead. Bloom is just as psychotic as some of cinema’s most memorable anti-heros — comparisons to Travis Bickle (“Taxi Driver“) and Patrick Bateman (“American Psycho“) are easy to make. Bloom is despicable right from the start and only becomes more depraved as he ascends the journalistic food chain by any means necessary. The dramatic weight loss adds to his character by further detaching Lou from the rest of society — his ethics barely register him as human, and his physical appearance matches this inhumanity. When his intern chastises him for not “understanding” people, Bloom later responds with the distinction that he understands people just fine — he just doesn’t like them. Rene Russo and Bill Paxton both turn in great performances in their supporting roles, and it’s a shame neither of them got more screen time, but the movie truly belongs to Gyllenhaal. Russo plays Bloom’s news director who tells him that “a screaming woman running around with her throat cut” is the type of footage the network is interested in, and he takes that to heart. There are some incredibly memorable scenes between Nina, Russo’s character, and Bloom. There’s a sequence in which the two negotiate that will make you howl with laughter while also forcing you to ponder how much of what we’re seeing actually goes on behind-the-scenes — the idea of monetizing tragedy is really brought home here. Open RoadRusso and Bloom have an interesting relationship, to say the least. Watching Bloom rise to the top via his own obsession with business strategies and corporate thinking gives the movie an extra layer of scorn and offers a compelling look at the mind of a sociopath. Since his obscene behaviour only increases his salary and helps his career, the audience is left to their own devices to figure out the moral of the story — is this what it takes to rise to the top in our corporate-minded world? Bloom can be viewed as an embodiment of corporate America, and that’s pretty a horrifying indictment. “Nightcrawler” is an extremely efficient thriller that is also stimulating on an intellectual level. Gyllenhaal has never been better and the role already has some throwing his name around for the Oscar race.